All of these pupils are listed in the Meeching school magazine published on this site. Can you spot yourself? 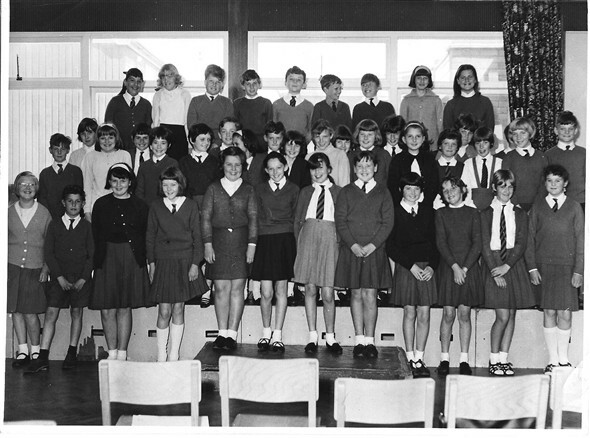 The photo wasn't taken at Meeching Junior School but Telscombe where we were visiting as the school choir. I'll see how many names I can put to the faces. Perhaps someone out there can remember the ones I can't! Back row L to R. Jacqui Rabet. Diane Stevens. Chris ? Richard Wood. Maurice Brocklesby. Nicholas Frazer. Graham Gough. Candy Knight. Anne Cotton. Middle row L to R. Laurence Deakin. Gaye Tucker. ? Janice Wingate. Janice Penfold. Marion Lower. Robert Poulton. Susan Lewry. Stuart Winton. Rosemary Townsend. Jacqui ? ? Deborah Whitehunn. ? Tracy Ware. Helen Russell. ? Jane Shoulders. Vickie Busk. Stephen Earl. Front row L to R. Barbara Revel. Brian Thorpe. Jacqui ? Gillian Morley. Kathleen Ralph. Gillian Pryor. Rosemarie Futej. Gilly Murgatroyd. Pammy Ryan. Marion Watson. Linda Colewell. Janet Flowers. This page was added by Helen Wagstaff (nee Russell) on 25/09/2007. Thanks for filling in a couple of gaps Kathy? Are you Kathy Ralph? If so, I haven't seen you for about 35+ years! Are you still local? Hope you're well. Jackie on the front row is Jackie Marsh. Is it Susan Payne next to Deborah White-Hun? Can't remember this photo! My hair is still awful! Hope everyone is happy. I'm a grandmother! Still see Anne Cotton, Rose Futej and Marion Lower. I have just come across this site - its so great to see all my old school friends. Brings back many happy memories. I went to one reunion some years ago, but have not bumped into anyone since. I vaguely remember singing in the choir. So many names I had forgotten! Hello everyone from down under. Hope you are all well. I see no one of course! Nice to see you pop up on to these pages Stuart. The last time I saw you was at our school reunion nearly 16 years ago! How often do you manage to visit the U.K? Hi Stuart. Nice to see you pop up on the site. I haven't seen you since our school reunion about 16 years ago! Do you visit the U.K on a regular basis? I also wonder where everyone is from this photo. I've only bumped in to a couple of people over the last few years. It is good to see a lot of old faces. How time flies it seems only yesterday that we were all at school together. I have been living in the US now for 20 years and am currently working on the West Coast and living on the East Coast so quite a commute. Let me know if there is ever any plans for another reunion. Anne Cotton arranged the last reunion. Still see her so will suggest another one. Oh my goodness! Just seen this photo, and yes it is me, Susan Paine, next to Deborah White-Hunn. I remember that day and the excitement of it all. So lovely to see all the old faces and to remember the names of friends at school. Thank you.